1) Wood does not respond well to being left out in the elements. Its rots. So, a porch built in the 1890s was normally in poor condition by, say, 1920. 2) As with clothes, cars, and hairstyles, houses are either fashionable…or not. A house built in the 1890s was deeply unfashionable by the 1920s. Kinda embarrassing even. The easiest way to update an exterior would be to lop off its porch, and replace it with one more fashionable. As such, thousands of homes across America had their Victorian-era porches replaced with mission-style or Colonial-Revival-style porches during the 1910s, 1920s, and 1930s. Numbers 1 & 2 often went hand-in-hand. 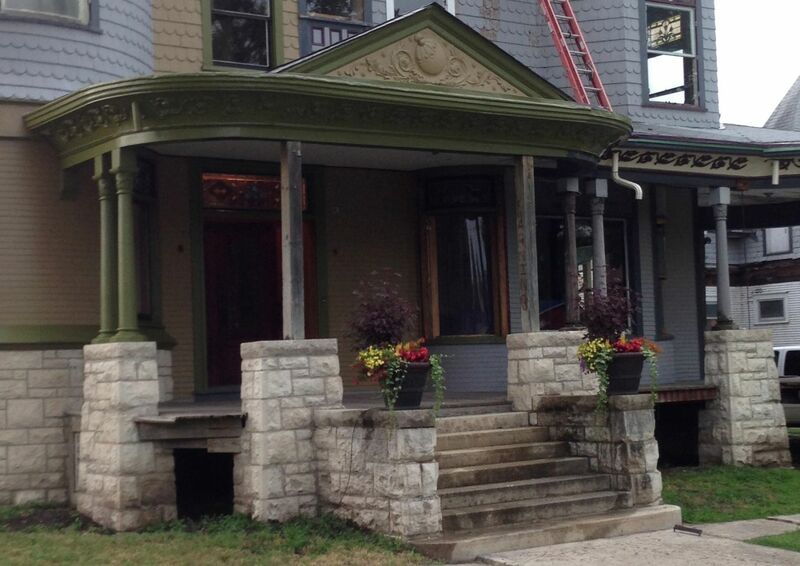 If you had a porch that was rotting, why not replace it, and at the same time update it? In short, it is rare that a porch built in the 19th-century is still around in 2015. Very rare. 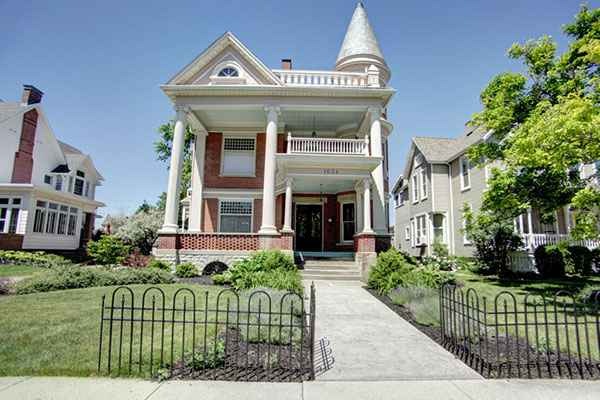 This is an 1887 house in Findlay, Ohio. It was recently featured on one of my favorite blogs, Old House Dreams. 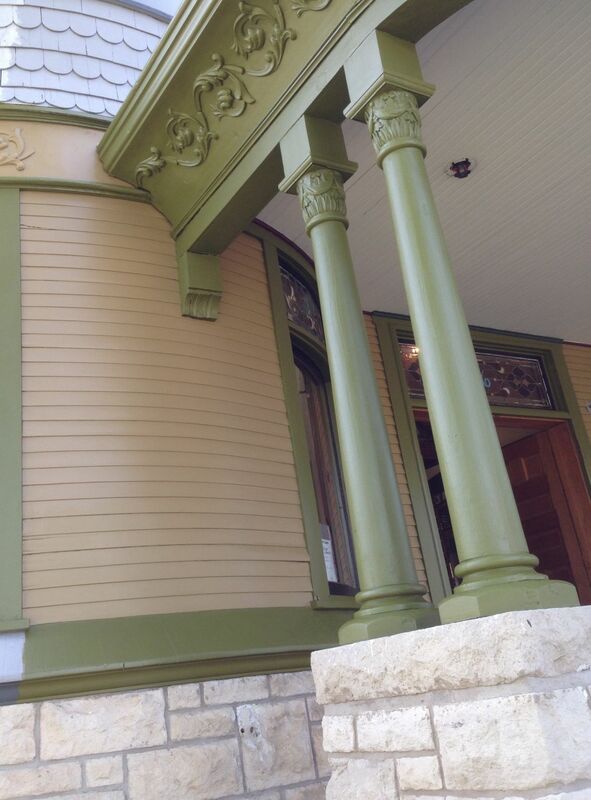 The Colonial-Revival porch is quite dramatic! Wow! But…but…something about it is not quite right. Like, see the tower cowering behind the porch? Well, that just ain’t right! The same house. I know, it is hard to believe. Note how the tower is no longer cowering and is, proudly and rightly, one of the glories of the house. Image courtesy of Amanda. 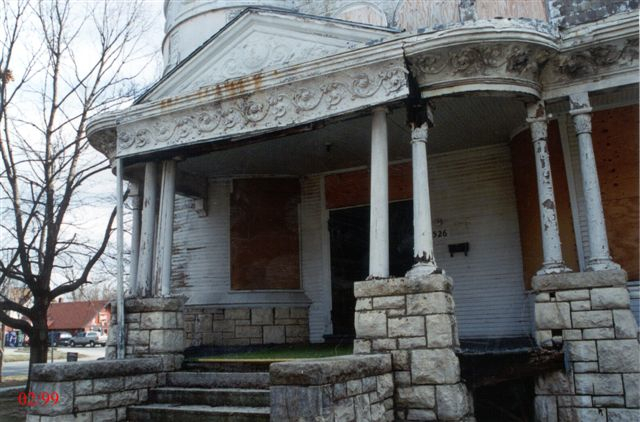 The house above typifies a widespread issue: original porches on old houses are rare. Which makes the porch of the Cross House all the more remarkable. 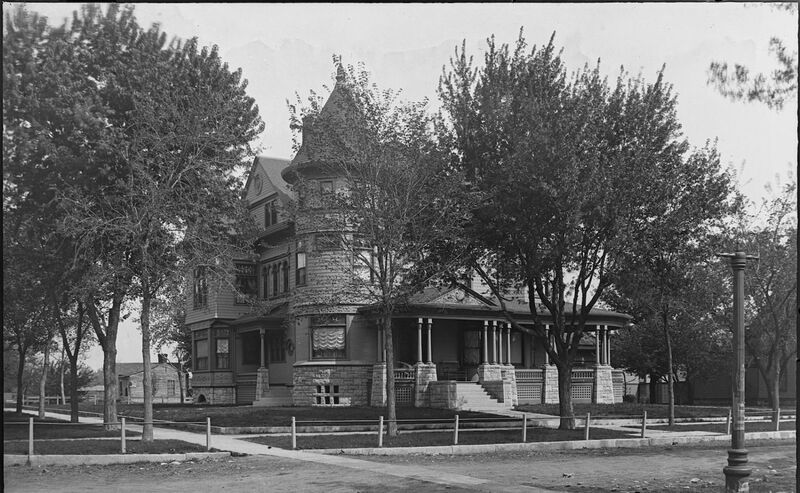 The Cross House, Emporia, designed by architect Charles M. Squires. 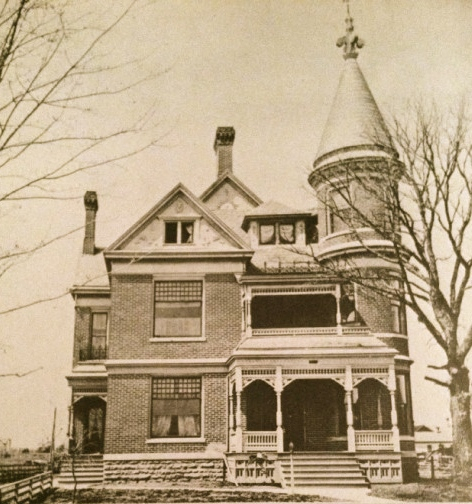 The image is from 1895, when the house was pristine and new. 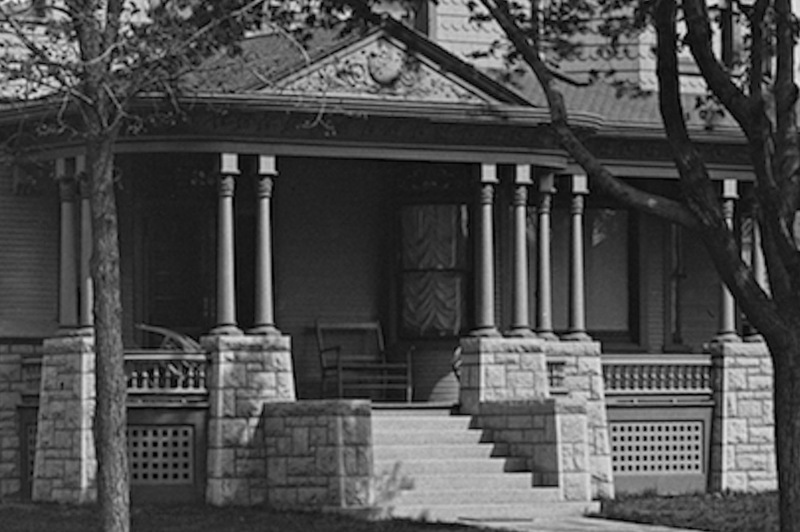 The Cross House front porch, 1895. It is all there! Columns! Balustrades! Lattice! The front porch, June 2014. Ahhh, lots-o-missing pieces. Sigh. Nonetheless, much remains. The stone! The roof! The extravagant tin cornice! Some columns! And, remarkably, the balustrades are in the basement, and some of the lattice exists! Zounds! The front porch, January 2015. 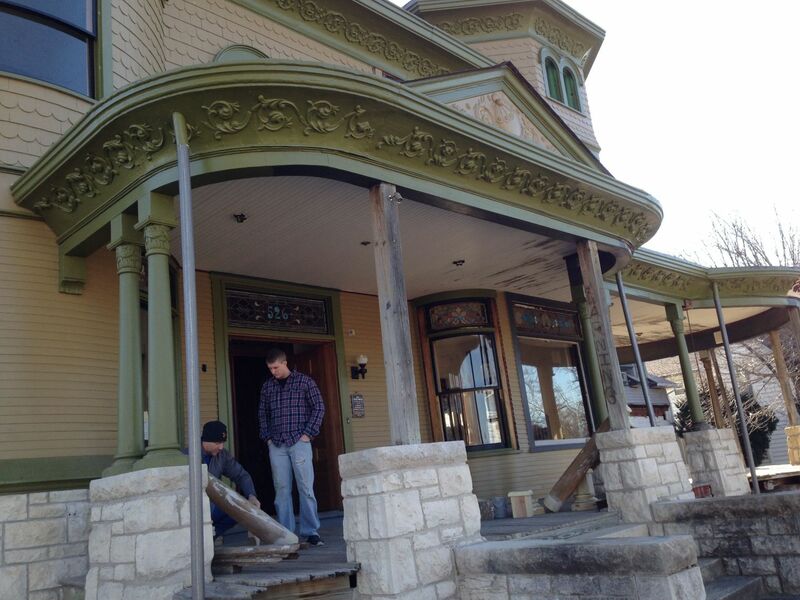 The resurrection of the 1894 porch begins! Whoee! Oh, say hello to Jeremy (standing) and Scott. The original 1894 redwood columns. As previously stated, I am in love with them to an unnatural degree. The front porch, 1999. It was at this point that the Cross House porch, after managing to survive for 105-years, was perilously close to being lost. It was saved by Bob Rodak, who purchased the house in 1999, and sold the house to me in 2014. See the paired columns to each side of the steps? Three are not original. Image courtesy Rob Rodak. 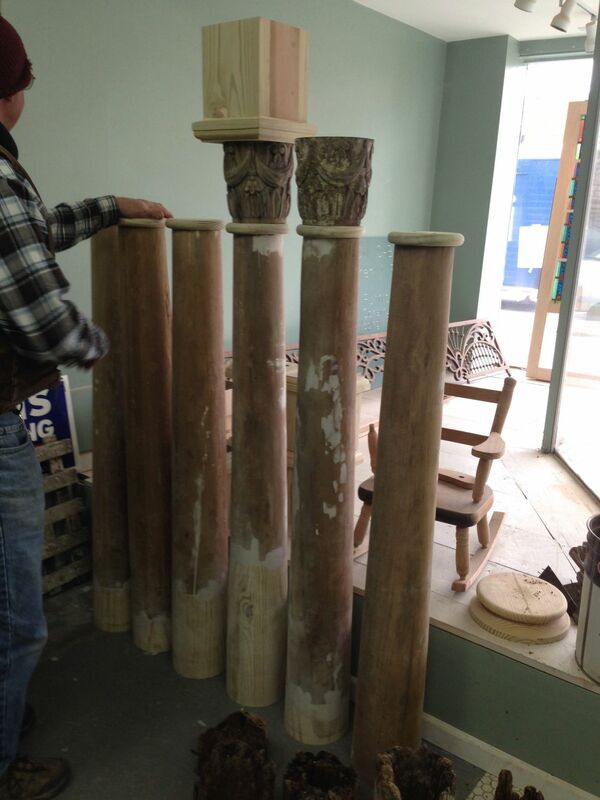 I had to send six columns off to the hospital, and through the miraculous work of Dr. Doug, the columns were saved. Saved! Thank you Dr. Doug! This week, these six columns are being returned to the 1894 porch where they have not been since 1999 (I found them in the backyard). The balustrades are being brought back to life by Dr. Doug as we speak. Pray for them. I have already had one section of lattice recreated. After the balustrades are back from the hospital, the remaining lattice will be ordered. And some of it will be curved! A few months ago I had the missing column capitals recast in resin from the remaining originals (hand-carved redwood). There are 6796 vital issues to deal with regarding the restoration of the Cross House. However, the item which MOST excites me, and the one which I have been greatly anticipating above all others, is the restoration of the expansive front porch. For, no matter how gorgeous everything else might be (and there are lots of gorgeous bits), the Cross House will never look right with its front porch not quite right. It is like looking at a beautiful woman…who smiles…only to reveal several missing teeth. Well, stay tuned to Part 2, as the adventure continues! I am breathless with anticipation! 5 Responses to The Great Column Adventure! Part 1. How exciting! Waves to Jeremy and Scott. Well done, Dr Doug. Amazing what can be done with resin?! Oh, she’s going to be even more beautiful than she already is. The laundry chute/dumb waiter story is rather swoon-worthy, too! I am very much enjoying reading your blog. I find it amazing what has been stored (fortunately) in your basement. The basement does, indeed, have a kinda Aladdin’s Cave quality! I’ve enjoyed reading your blog. I am so pleased to see a reference to a Findlay, Ohio, house. Due to a “gas boom” and a later “oil boom,” Findlay’s South Main Street is about 10 blocks of “millionaire’s row.” As a young married woman my husband and I would put the baby in a stroller and walk S. Main right at twilight so see the glowing interiors — with lots of stained glass windows — as lights were turned on for the evening. I think the owners were proud of their interiors, because no one seemed to pull their drapes when the lights came on. I, too, love walking around at night and looking at lighted up houses! With curtains opened!